The original plan for the new kitchen in this extensively renovated Kingsland Villa called for a walk in pantry behind closed doors, a much smaller window and generally less workspace. But with a few innovative ideas, this kitchen now feels anything but small. The first, and most important, change was to delete the door and pantry, substituting cabinetry and continuous benchtop to increase storage and work area. In addition to giving the overall space a much more open feel, the immediate benefit was the ability to add a much larger window to enjoy the home’s expansive views. The benchtop narrows progressively towards the back wall, using angled cabinetry to provide adequate clearance. Open shelves on the opposite wall also contribute to the sense of space and a place for the owner’s collection of useful storage jars. 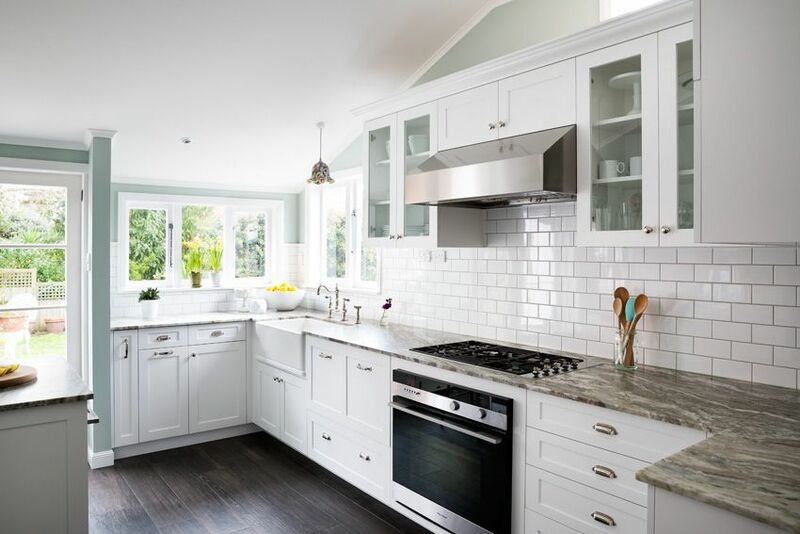 An old style AGA stove, butler sink, subway tiles, forged iron cabinet hardware and v-grove paneling accents are just a few of the features that are used to create traditional style in this lovely and hardworking kitchen.